Healthy Families is a community-based, voluntary prevention program designed to prevent child abuse and neglect and promote healthy child development. It is designed to help teach parents of newborns how to be the best they can be at their most important job - raising and nurturing their children. Through in-home visitation by a trained Family Support Worker, parents learn to build positive parent-child relationships, how to enhance their problem solving skills, and ensure that their child receives the best possible medical care during those critical early years. What can Healthy Families do for you and your family? Increase your confidence in parenting. Promote and encourage education, for you and your family. Teach you to manage your finances. Learn more about community resources and how they can help you and your family. Healthy Families Brevard was the direct result of a strategic partnership between United Way of Brevard and twenty-three local agencies and organizations committed to serving Brevard's children. This collaborative effort paid off in November of 1998 with the award of a grant to bring this special child abuse prevention program to our community. United Way of Brevard is both the administrator of the grant and the direct service provider. 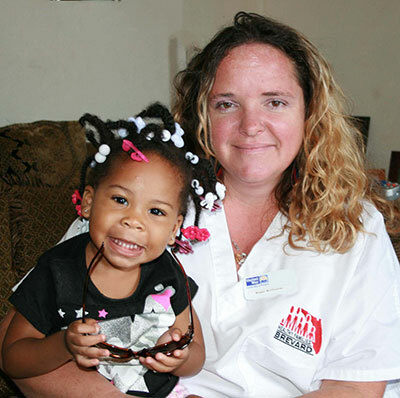 United Way currently supports Healthy Families offices in Titusville, Cocoa and Melbourne, providing services to expectant families/families of newborns in target zip codes areas throughout the county. For more information about the Healthy Families Brevard Program, please contact Mackenzie Quirarte at 321-409-1100 or via email at mquirarte@uwbrevard.org. Click here for the Spanish version of the brouchure.